← Bolivia does not want evo any longer! The country’s worst drought for 25 years has led to water rationing and slashed harvests. 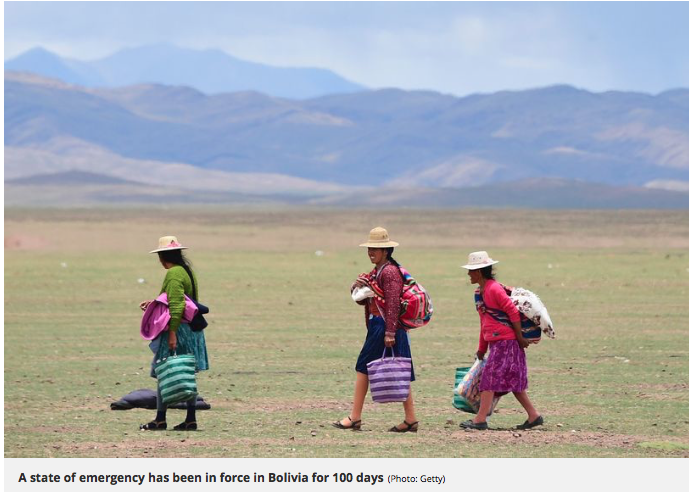 A state of emergency has been in force for 100 days in drought-hit Bolivia where climate change has seen almost HALF of its glaciers disappear in two decades. Climate change has caused hotter dry seasons and shorter, more intense rainy seasons in the country. Recent rains have eased drought conditions in parts of the country but the capital, La Paz, remains unaffected. Drought and water scarcity have become recurring problems in Bolivia over the past decade, but the situation has been “particularly alarming” since 2015. And the Latin American nation has lost at least 40% of its glaciers in just 20 years, according to the United Nations. Bolivia is to seek $250 million from the Green Climate Fund for projects to bolster water management and food security. The U.N. Food and Agriculture Organization is supporting Bolivia’s application for funding. After eleven years in government and total control of ALL State powers … $180 billion dollars were wasted, aside of his “museum” … enough! This entry was posted in Bolivia, Environment, Politics, Social Unrest and tagged demagogue, democracy in peril, drought, environmental damage, government failures. Bookmark the permalink.